Equalify Pro is an equalizer for the Windows desktop version of Spotify. A valid Equalify Pro licence and having Spotify installed is required for Equalify Pro to work. Equalify Pro is an equalizer for the windows desktop version of Spotify, Windows 7 or above is fully supported. Please use the normal installer available on the Spotify website when installing Spotify. The Windows Store version of Spotify is not currently supported. This time it is fully parametric and is built for the new version of Spotify, and therefore requires Spotify v1.0 or above to work. Equalify Pro was initially released in May 2015 and is being updated continuously. Since the creation of the original Equalify plugin, it has evolved a lot; both in visuals and features. Equalify Pro blends beautifully into Spotify, just click the Equalify Pro button in the Spotify window to show the equalizer and you can enhance the audio for the best listening experience. Equalify Pro is now able to seamlessly change the output device without having to restart Spotify, or even pause the music that is playing! It is simple to install, and when you create an account you can choose from various license models to suit your needs. The multitude of settings makes it easy for you to get Spotify working and sound like you want it to. You will be able to download Equalify Pro after logging in and purchasing your license. The original Equalify equalizer was created on my spare time in 2011. It was initially intended just for me and my friends, but soon gained popularity way outside my circle of friends. It was released to the public for free shortly after and gained over 150 000 users over the years, and got a lot of positive press on websites like CNET, lifehacker, evolver.fm (and many more) and even got featured in the Spotify for Dummies book. * Every user on a machine that uses Equalify Pro will use one activation. Licenses are personal and not shareable! ** Upgrades means new major versions of the software. Windows 7 and above is fully supported. Vista and XP might work but no guarantees! 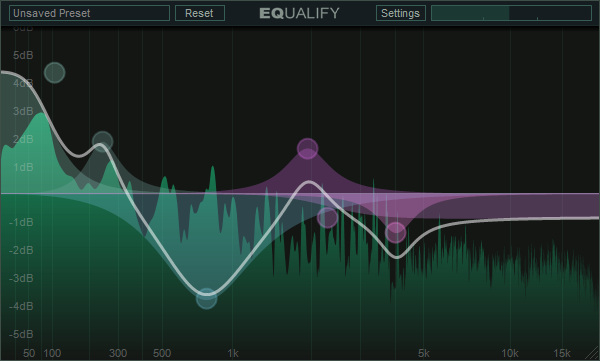 Equalify Pro features a fully parametric equalizer. You can add as many bands as you please in any location you please. You can select between Peak, Low-Pass, High-Pass, Band-Pass, Low-Shelf, High-Shelf and Notch filters for each band. Spotify does not have a built-in way to change the output device, Equalify Pro fixes that with its own device changer. The new device changer can change the output device on the fly, without needing to restart Spotify for the changes to take effect! 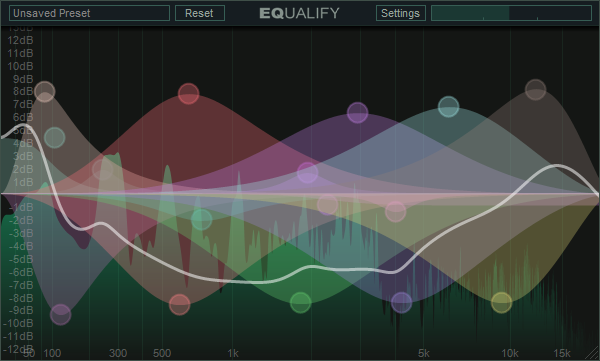 Equalify Pro also contains a built-in audio spectrum analyzer that can be used to make your filters perfect, or just for entertainment by watching the graphics dance. 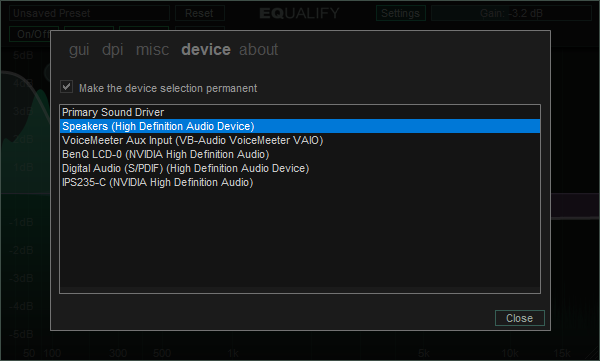 Equalify Pro also includes a -12dB to +6dB gain/preamp that should be used when you add to the audio signal. There is also a limiter in Equalify Pro that will let you tweak your bands to your hearts content without worrying about clipping the signal. You can save as many presets as you like, and its easy to switch between your saved presets.